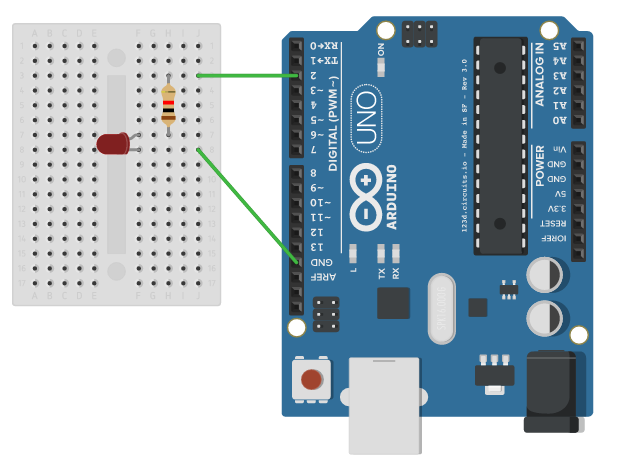 This tutorial presents how Beebotte can be used to control a led connected to an Arduino board. We will use MQTT protocol to connect Arduino to Beebotte to subscribe to messages to turn ON or OFF the led. For the purpose of this tutorial, we will create a channel named Arduino and add a resource led with type boolean. We will enable the Send on Subscribe (SoS) option on the resource. When enabled, this option allows the most recent persistent value to be automatically sent over when a client subscribes to the resource. This is particularly useful to set the LED to the corresponding state after a disconnection. #define LEDPIN            2         // Pin which is connected to LED. In your account page, go to My Dashboards and click Create Dashboard; enter a friendly name and a short description for your dashboard then add an ON/OFF Widget. Indicate the channel and resource you want to control with this widget. Voilà. You need to log in to your Beebotte account in order to control your LED with the ON/Off widget. This is to restrict control widgets like On/Off to authenticated users.